This is a long running and continuing journey around a collection of ideas, projects, games, models and a variety of wargaming related themes from my own imagination and from others. As I have been described as having the attention span of a forgetful goldfish you can rest assured the resulting subject matter will be diverse and (usually) entertaining! The first of the new 1/2400th scale WW1 warships for the Royal Navy and the High Seas Fleet completed today. They have been painted using my now standard black undercoat and umpteen layers of grey dry brushing - all using Humbrol enamels (except for the bases). S.M.S. Lutzow and Derfflinger - the later Hindenberg differed in minor details. H.M.S. 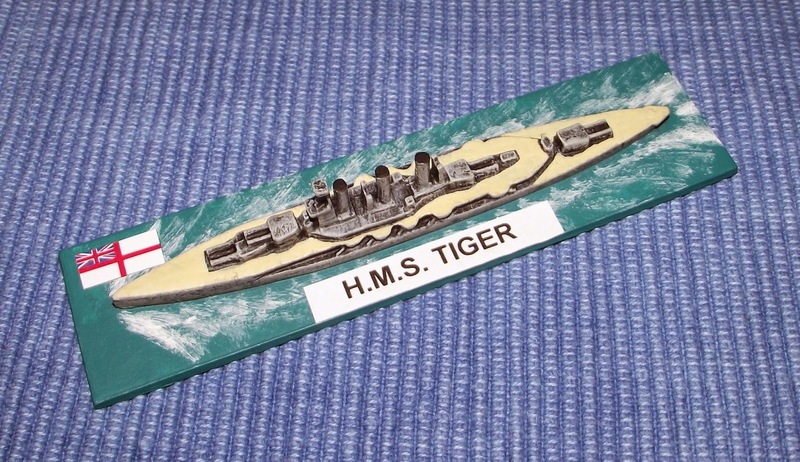 Tiger - the design was similar to that of the Japanese Kongo class. S.M.S. Lutzow - hit by some 24 heavy shells at Jutland and sunk by the Germans when flooded with some 8,000 tons of water. H.M.S. Tiger - a very handsome looking ship until her late war makeover, described in Jane's Fighting Ships as "her present hideous rig." I was absolutely delighted with the way these turned out and should now push on with the rest of the collection. I will need to add some of the earlier battle cruisers - which of course means I will be able to add the Seydlitz - which will give me a pretty good WW1 set up for the North Sea and further afield should the need arise. It was great fun painting them as well! Beautiful mate - that deck colouring can be hard to get right but I think you've nailed it! Excellent looking ships David. I love the WW1 Naval era and think Jutland is a fantastic battle to research. Very nicely done sir! And much neater than even my 1/1200 scale ships! Many thanks indeed old chap! The decking is an old Humbrol Authenticolour enamel - Mast Oak. the tin I am using must be at least 30 years old and I was worried that it might be too bright but as it does not cover very well it looks kind of, well, 'lived in'. I really enjoyed doing these and just to let you know - H.M.A.S. Sydney will be getting a sister ship! Cheers old chap! All I can say is WW1 naval with loads of battleships (or indeed any ship) and very little in the way of aircraft has a lot to commend it. I have quite a few more to paint but am feeling serenely confident they will be a breeze! Many thanks old chap! The Stonewall castings are not great - I like to think of them as 1/3000th models on steroids - but scrub up rather well. They certainly are good enough for wargames purposes. I will add some selected C in C models to complete the collection - mainly the early battle cruisers - but other than that I have pretty much most of what I need. Cheers old chap! I have not used the technique on 1/3000th but I am sure it would work as well. More 1/2400th WW1 to follow though! Yours in a White Wine Sauce! Clearing a nest of Sea Rats!